Betting exchanges are becoming increasingly popular for bettors looking to bet with better odds than the ones on offer at traditional bookmakers. Many believe that betting with an exchange will always provide better value than a bookmaker. The question is; is this actually the case? Read on to find out. Betting exchanges have gained prominence over the last decade, especially as bettors have become more educated and found their options limited in terms of being able to place a bet. Although what the odds mean and how you place a bet is the same as a normal sportsbook, there are several differences when it comes to using an exchange. With a traditional sportsbook, it is a company who operates as the bookmaker. The bookmaker determines the odds on offer and available limits and they make money if you lose or pay out if you win. In contrast, an exchange service pits bettors against one another and provides the option to both “lay” (post odds) and “back” (bet on) the outcome of a particular event. Betting exchanges make money by charging a commission on top of any profit you make as a customer (this typically ranges from 2-5%). A bookmaker, however, ensures they make a profit by offering odds that don’t accurately reflect the true probability of an event – the adjustment they make to the odds is called a margin. An exchange is merely a platform for users to place (or take) bets and while it has various benefits, it also has some often overlooked downsides. One of the biggest positives of betting through an exchange is that, unlike a sportsbook, it doesn’t rely on betting margins to make profit. This means exchange bettors will benefit from better odds compared to those betting with the average sportsbook. If you want to bet on a particular event using an exchange, you need someone who thinks they have sufficient knowledge to actually offer that market. Another benefit that an exchange service offers bettors – and for some the most useful – is the ability to trade the market to guarantee profit. The act of “laying” a bet at a shorter price than when you have “backed” it (or vice versa) is often referred to as “greening up” – this is because all potential outcomes of an event appear in green to show how much profit will be made. Although the odds might offer more value at an exchange compared to the average bookmaker, the amount you are able to bet is determined by the liquidity of a market. If you want your bet to return more than anyone is willing to risk paying out, you will have to settle for less or wait for someone else to offer the same bet (at the same odds) to increase your stake and potential returns. In addition to having to bet with lower limits than you might want, betting through an exchange means you are reliant on other people posting markets. If you want to bet on a particular event using an exchange, you need someone who thinks they have sufficient knowledge to actually offer that market. Many of the benefits listed above make sense if you are betting with the average bookmaker. 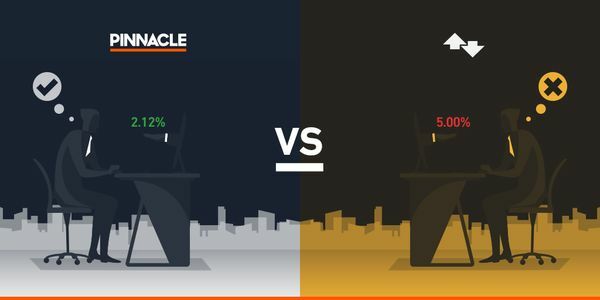 However, Pinnacle is different and has a unique offering that challenges the claim that a betting exchange will always offer more value than a bookmaker. Renowned for having the lowest margins online, Pinnacle provides better value odds than any other bookmaker. The odds you see listed on an exchange might still be higher than Pinnacle’s (even though Pinnacle’s margin is as low as 2%) but the commission rates for the exchange aren’t factored into the odds you see. If you want to find the best value, you need to consider the impact paying commission will have on your profit in the long term. As well as its low margins, Pinnacle also has the highest limits online. If you’re serious about betting the amount of money you are able to bet is just as important as the odds you’re betting with. The average bookmaker and a betting exchange both have their limitations when it comes the amount of money you can place per bet. Pinnacle, on the other hand, does not. The notion of value extends beyond odds, the limits you bet with and the number of available markets to bet on are just two more examples of things that serious bettors will want to consider when deciding who offers the best value. While bets of €40,000 are commonplace on Premier League matches or NBA and NFL games at Pinnacle, these limits regularly exceed €100,000 for major events. As well as having higher limits than anywhere else, Pinnacle also as a re-bet function that lets you place another high limit bet within seconds of your previous one (they may adjust the odds slightly after each bet though). Due to how Pinnacle operates, the size of its limits, the number of customers placing bets and the fact that it uses teams of highly skilled traders to manage its odds, you will also find a wider variety of markets on offer compared to a betting exchange. Whether it’s Finnish soccer, Brazilian basketball or Italian volleyball, betting on obscure markets is never a problem at Pinnacle – serious bettors will understand the value this offers as it is often easier to get an edge in more obscure markets. Limiting and closing accounts has played a major part in driving customers away from bookmakers to betting exchanges. This isn’t an issue at Pinnacle as winners are always welcome – regardless of whether you have expert knowledge or valuable information about a particular sport or can identify arbitrage betting opportunities, your bet will always be welcome at Pinnacle. In order to quantify the difference in the odds offered by Pinnacle, the average bookmaker and a betting exchange, we can run a simple test. Using the 2016/17 Premier League season (a sample of 380 games) if we take the 1X2 closing odds for Pinnacle, the average bookmaker and apply a logarithmic function to the fair (no margin) odds to represent the betting exchange, we can find out at which of the three provides the best odds. The betting exchange profit figure above is based on the standard 5% commission structure. While it is possible to bet with lower commission rates, exchanges can also apply commission charges of up to 20% depending on how successful you are (in addition to how much profit you make, this is also based on the number of markets you’ve bet on and how much commission you’ve paid in the past). Although the results above show that you would make more profit betting with Pinnacle, it is also important to remember that this is still a relatively small sample of data (it only covers one market in a particular league of a single sport). The odds you bet with are also only one component of betting (albeit the most important). The notion of value extends beyond odds, the limits you bet with and the number of available markets to bet on are just two more examples of things that serious bettors will want to consider when deciding who offers the best value. ← What can closing odds tell us about profit expectation?